On September 27, 2013, California’s governor signed Senate Bill (SB) 743 into law, in part mandating the transition from a level-of-service-based (LOS) measure of transportation environmental impacts to a vehicle-miles-traveled-based (VMT) one in compliance with the California Environmental Quality Act (CEQA). Several California jurisdictions, including San Jose, Pasadena, and San Francisco, have moved quickly to comply with SB 743, so it is no surprise that several of these early-adopter cities have been working hard to develop powerful VMT estimation methods and tools using the most recent research available. 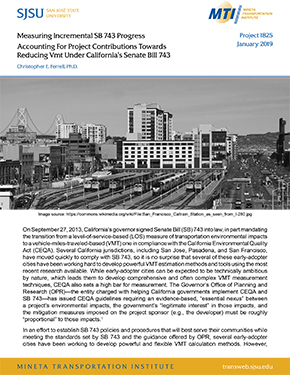 This perspective uses the experiences of an early-adopter city, San Jose, to identify and illustrate the challenges faced by California planners trying to meet the legal requirements of SB 743 and the practical needs of their communities in developing the VMT calculation methods. Dr. Ferrell began his planning career in 1995 working for the Metropolitan Transportation Commission (MTC) on intelligent transportation system (ITS) applications for traffic management. Since 2000, he has worked as a transportation consultant and most recently at MTI’s Senior Research Scientist. In 2010 he co-founded CFA Consultants, a transportation planning and research firm. Dr. Ferrell completed his doctoral studies in city and regional planning at the University of California, Berkeley in 2005.